for $725,000 with 5 bedrooms and 4 full baths, 1 half bath. This 3,810 square foot home was built in 2015 on a lot size of 0.5900 Acre(s). 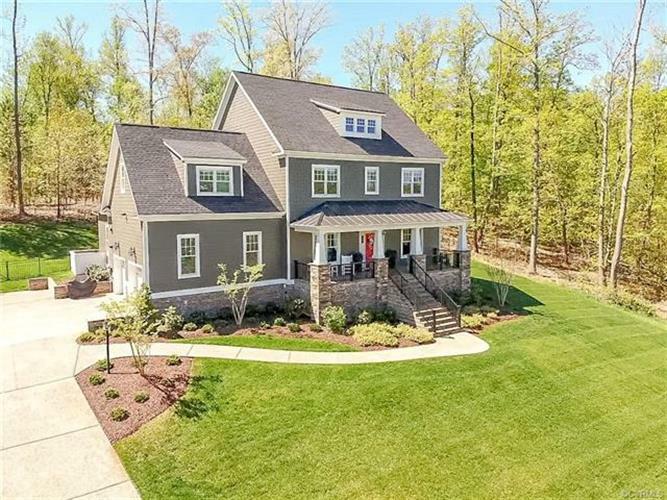 You are going to love this 5 bedroom, 4.5 bathroom custom home located in Tarrington! With over $60, 000 in builder upgrades, this home features HIGH CEILINGS, a fabulous SCREENED IN BACK PORCH overlooking a fenced yard, CUSTOM STONEWORK, a FIRST FLOOR BEDROOM with FULL BATH, UPGRADED 5 INCH FLOORING, and AMAZING LIGHT FIXTURES! The stunning kitchen boasts an oversized granite countertop island, custom cabinetry with roll out drawers, double oven, wine cooler, walk-in pantry. Living area has immaculate coffered ceiling and high-end, upgraded gas fireplace! From the living room, the screen porch can be accessed through 2 glass doors (with floor to ceiling windows in between - swoon!). The dining room features 5ft custom wainscoting and 4-member crown molding. Master bathroom is complete with granite countertops, frameless glass door shower, dual shower heads, double vanities, and a clawfoot tub! Additional features of this home include Anderson windows, a home theater system in family room, Vector security system with home automation! Home features an 860 sq. foot unfinished 3rd floor. Home in immaculate condition, but priced below county assessed value of $740, 600 for quick sale.